May 6 - Can I have the baby back? This morning was a repeat of yesterday morning, except this time Dewey and Clarita managed to get to Starbucks - the other Starbucks, the one a block north rather than a block east. We got another cab, and went the same exact route, but this time we ended up at Hotel Avanti rather than at the train station. Today we were on all day tour of places in Kyoto itself, rather than Inari or Nara. We picked up some guests at a couple different spots, and at one hotel there were people missing. 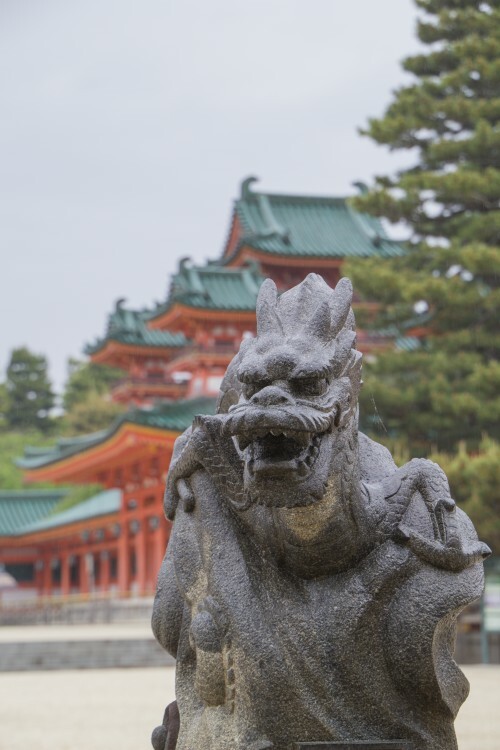 Our guide told us we needed to be very punctual today, as if we were late to the Imperial Palace, they wouldn't let us in. We were wondering if they'd actually leave people, and sure enough, yes. We were told a bit of history about Kyoto, including how it was built in 794 and was the original capital, how it was not bombed during World War II and thus still maintains most of its historical buildings, and the reason for why there are so many Buddhist temples - apparently each neighborhood built its own temple to prove to the other practitioners that they weren't Christian. 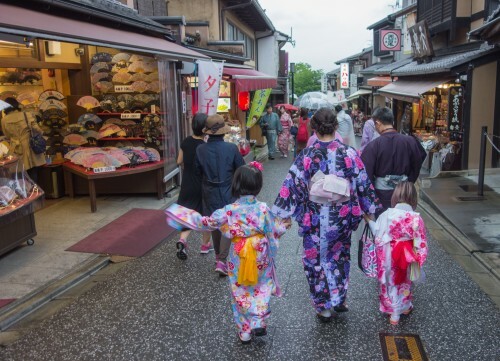 We also heard that the Gion area is the Geisha district; we made a mental note to stop by there the following day. 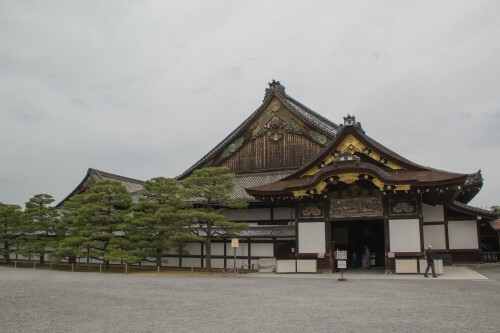 Our first stop was at Nijo Castle, and specifically Ninomaru Palace, which is the main building inside the compound. It was a little odd, because the front gate and one of the other buildings were under construction, and the white tarp covering the buildings had pictures of what was underneath. So we couldn't see the actual building, but had a giant poster to look at instead. 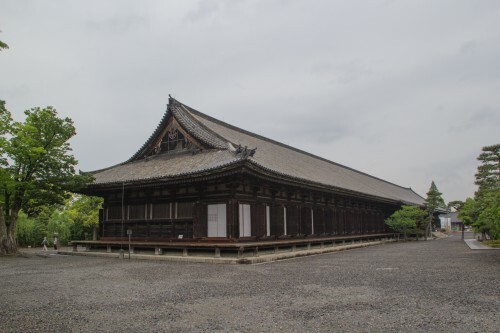 The main palace was not under construction, and was in particularly good condition given its age. 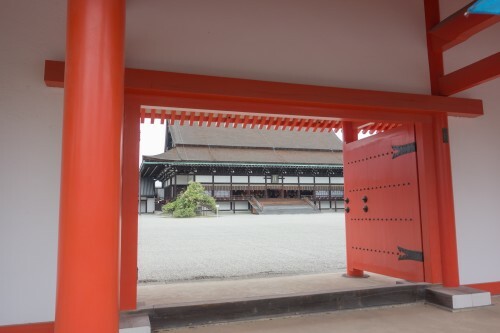 The floor inside purposely squeaks, so as to alert the Shogun and his people to any possible intruders. We got led around to look at all the various rooms inside the palace and what each was used for. They had put models in the rooms to give an idea of how things looked. 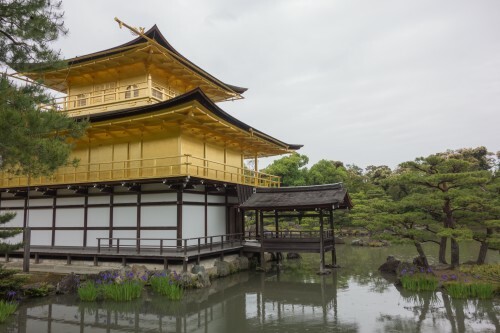 Although things were good in Japan pre-Western contact, when Commodore Perry arrived, everyone agreed that they needed to be better and stronger. So around 1874 the new imperial government made a power grab, and decided the Shogun wasn't necessary any more. So the Shogun had to give back some of his property and retire. 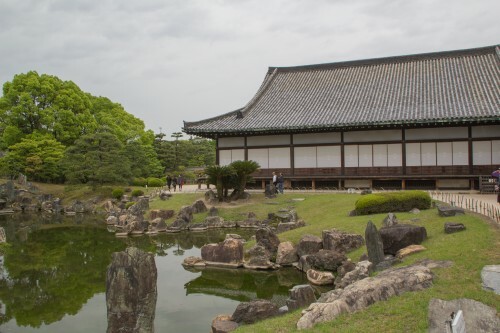 This included the palace in Tokyo - which is now the Imperial Palace - and Nijo Castle. We couldn't take any pictures or video inside, and outside everyone kept getting in everyone else's photos, as there were a handful of people seemingly oblivious that others might want to take pictures. Whatever. 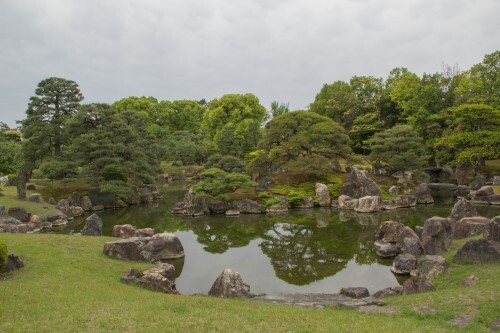 There was a nice garden behind the Ninomaru Palace, but we were really short on time so had to do a quick run-through. On the drive from Nijo Castle to Kinkaku-ji we passed by Spoon, which was one of the two restaurants that Dewey tried to get reservations at the night before. 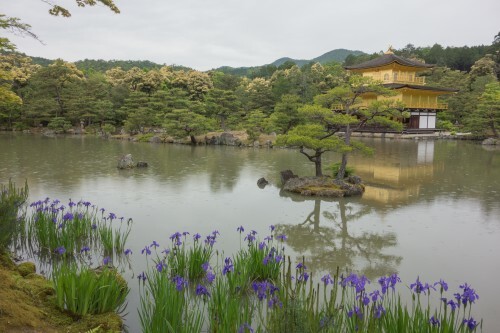 The distances on the bus were much less than the day before or when we went to Mount Fuji, but every minute was torture as there was a baby who was bawling the entire time. We wondered what sort of people would bring a baby on all day tour, in a bus, with dozens of other people. 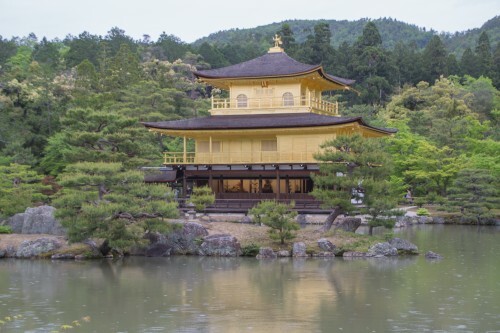 Our second stop was at Kinkaku-ji, or the Golden Pavillion. 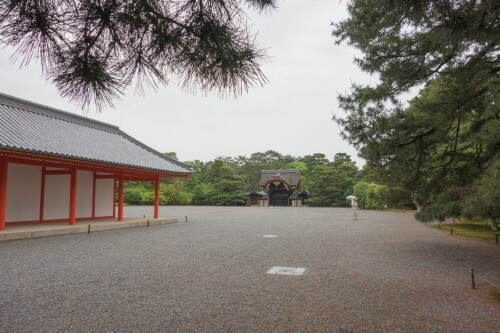 It used to a villa for the Shogun, but was also part of the property given back. 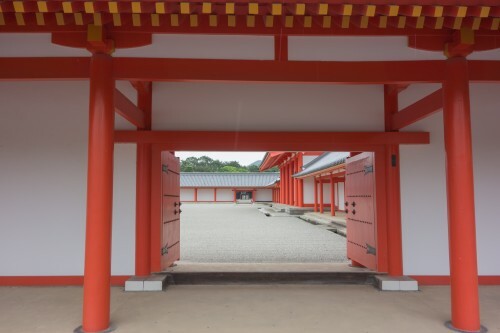 The original building was burned by a mentally disturbed person, so it was rebuilt identically. 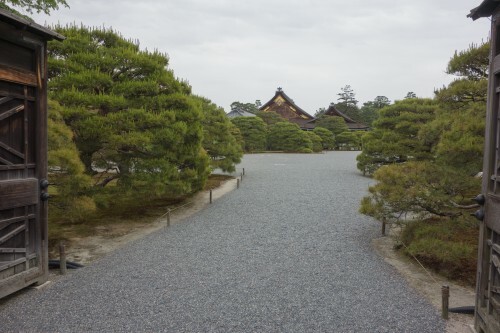 Somewhere in the vicinity was a 600 year old pine tree that originally was a bonsai tree. Our guide was a bit of a comedian, and her sense of humor was dry sarcasm, so we couldn't tell exactly what was a joke and what wasn't. But more than anything else, she put the fear of God in us regarding staying on time when she told us what time we needed to be back at the bus. 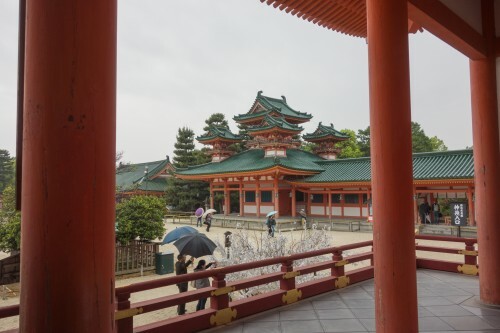 We'd all gotten back on time at Nijo Castle, and we hoped it would be the same here. 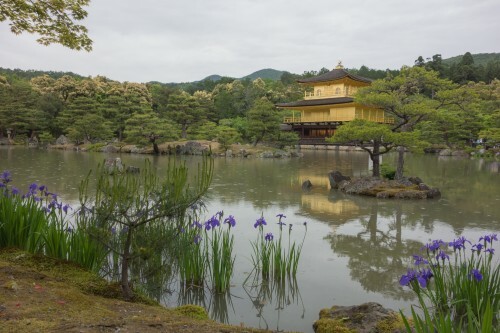 She mentioned that the Golden Pavillion was the most awe-inspiring of the temples in Kyoto, but that the Silver Pavillion, Ginkaku-ji, was a bit more authentic. 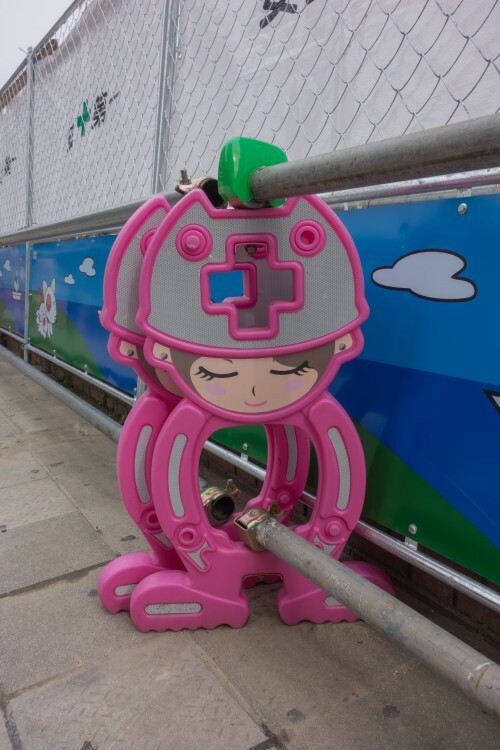 She also mentioned that the beginning of the Philosopher's Walk was there. 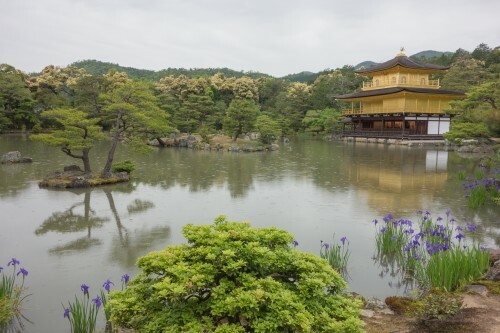 The view at Kinkaku-ji was very nice, but the sun never came out, and it fact there was a light rain that started whilst we were there. We got to walk around for a bit on our own time, and then we all got back on the bus - on time. On the way to the next stop she told us about the five elements of purification - waer, salt, fire, sand, and sake. Apparently for the sake there shouldn't be too much "purification," i.e., drink, but don't drink too much. 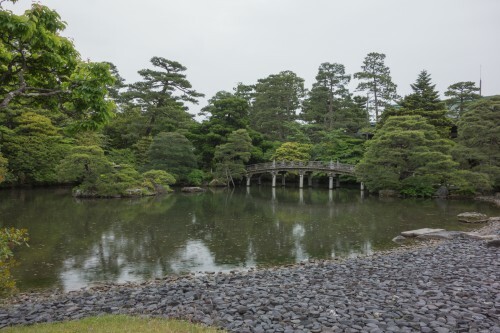 She also told us about Ditoku-ji, a temple with a nice zen garden - we made a mental note to go there tomorrow afternoon. [Note: This didn't end up happening.] 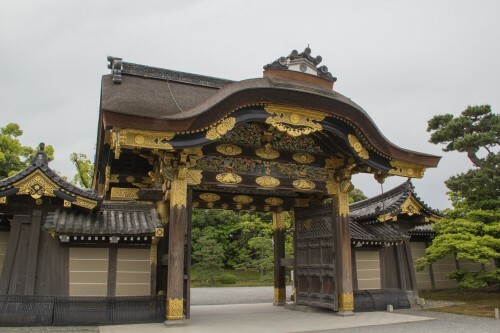 As we were driving around, we passed dozens of temples and shrines that didn't even warrant a mention from our guide. 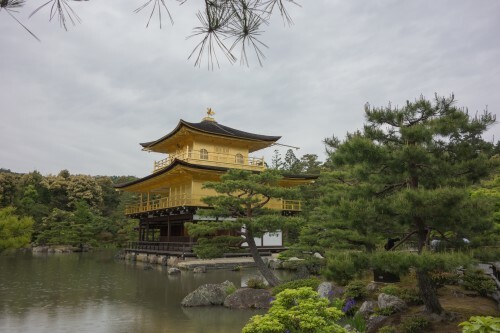 Our guide also mentioned that when the capital moved from Kyoto to Edo (now Tokyo), the emperor just left without saying a word, he just left. It reminded Justin of the Colts leaving Baltimore for Indianapolis. Tokyo, strictly translated, means "East Capital." 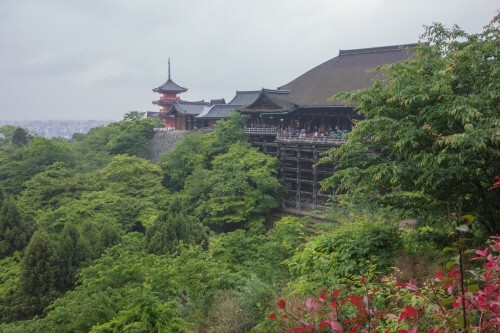 One more item we were told is that Kiyomizu - a temple we'd be visiting in the afternoon, was built in 778 and had a mix of both Buddhist and Shinto elements. 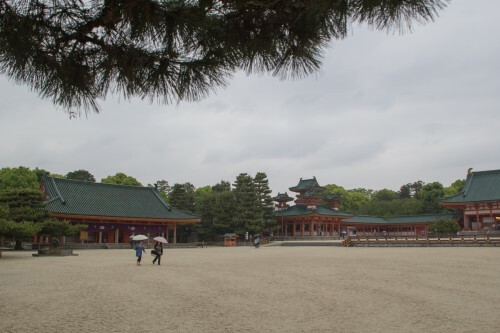 Our third stop was the Imperial Palace. Unlike the first two places, this place was much more strict and orderly. Our guide mentioned that there were several guards, and that we should wander off and take photos, that we might get kicked out. Even on the outside we noticed several guards. We also had to line up in sets of four, supposedly so that the guards could more easily count us. Our walk around the grounds were very regimented, and we wanted to wander off a little bit to get some photos, but fought the urge, as we didn't want to get kicked out. 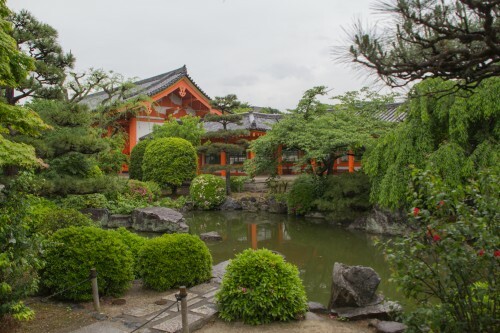 We wrapped up around noon, and then we went to a buffet lunch at the Kyoto Handicraft Center, right near the Heian Shrine. The rain had started to pick up a bit, so it was good to get out of the weather for a bit. Inside, the baby continued to bawl constantly whilst we ate. We tried to drown out the noise by focusing on the fried chicken bites that we had seconds (and maybe thirds) of. It's kind of amazing how much great fried chicken there is in Japan, and we're curious why that style of fried chicken isn't more popular in the states. 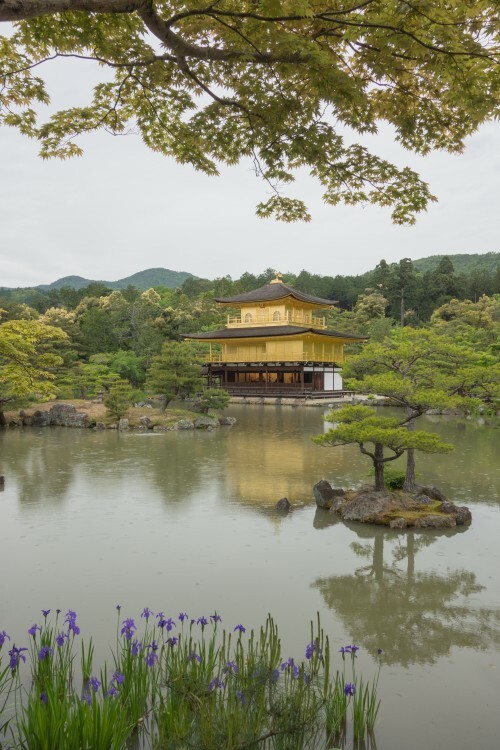 For the afternoon, half of us would be staying in Kyoto, and the other half were going to Nara and doing what we did the day before. 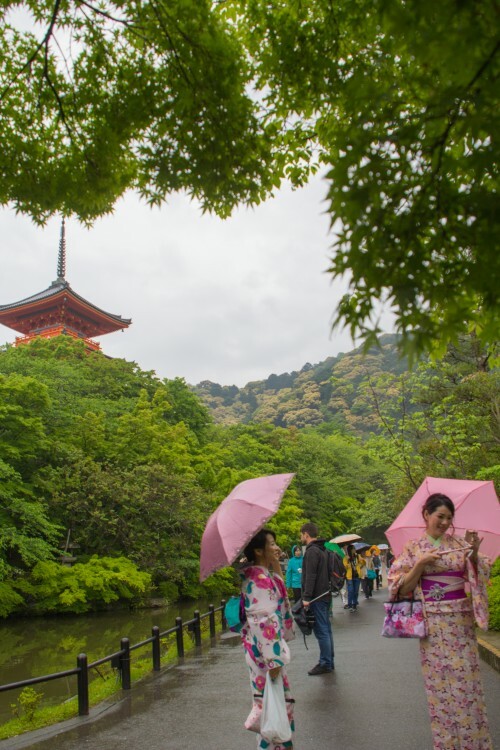 We looked around to see if the annoying photo bombers were staying or going, and thankfully most of them were going to Nara. Sadly, the family with the screaming baby was staying. For the afternoon we had the same bus but a different guide. While we never caught the name of our morning guide, our afternoon guide was named Saiko, which she confirmed was pronounced "Psycho." Jokes from her as well. 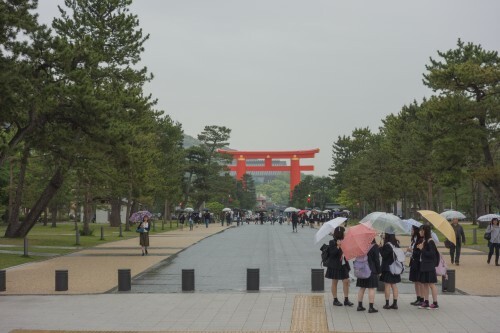 Our first stop was at Heian Shrine, and by this time the rain was pretty steady, but still not too bad in terms of how hard it was falling. Umbrellas were out everywhere, which was tough for Justin, since short people holding umbrellas means lots of umbrellas right at eye level. 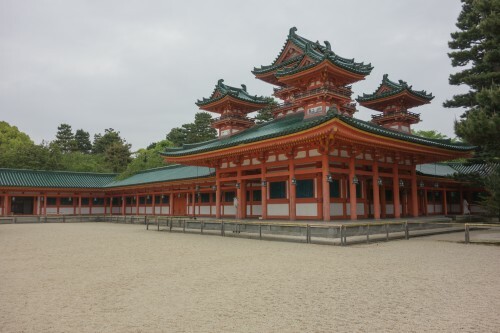 Unlike most of the other shrines we had been to, Heian was a lot more open, with buildings around a large perimeter with a big open area in the middle. 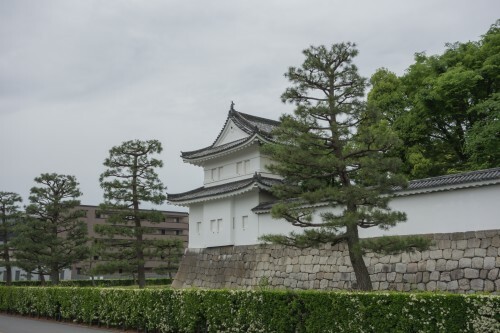 We took a short drive south from Heian to Sanjusangendo Hall, which is actually just east of the train station (across the river). 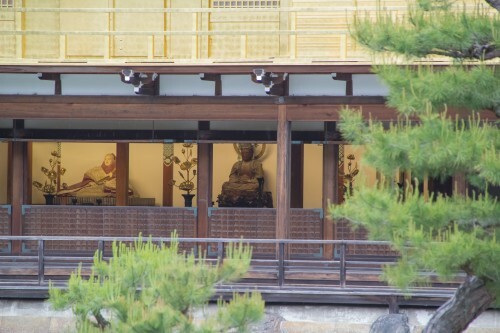 Sanjusangendo is renowned for its 1001 life-sized wooden statues of the goddess Kannon. 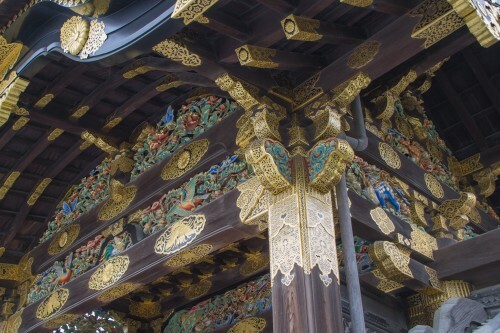 The building itself is made out of wood, and it is the largest wooden temple in the country. 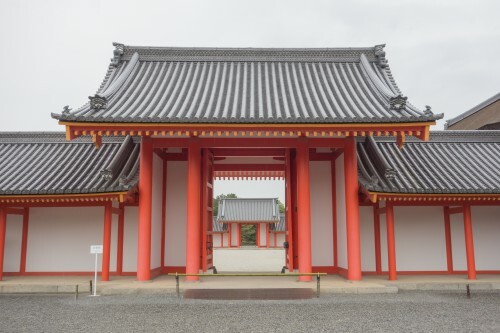 Sadly, there are no pictures allowed inside, but you can look at what all the Kannons look like if you search around on the web. Best as we can guess, the Kannons were about 10 deep by 100 wide, and the 10 levels were on stairs, so you could see all 1000. 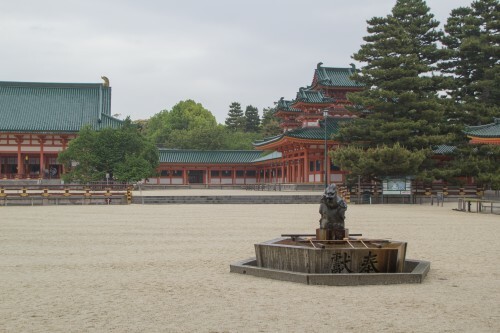 Then in the very middle there was 1 much large Kannon statute. It was very impressive, and we really recommend it. After walking through we took a nice walk around the grounds. Justin just made it back in time, right at the deadline, but it was a non-issue since someone else later. 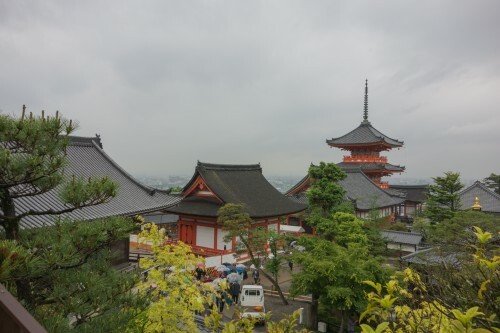 Our last stop of the day was Kiyomizu in the southeast part of town. 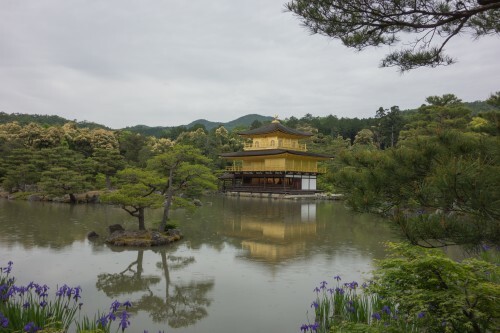 It is one of the most popular, if not the most popular, tourist spots in town. 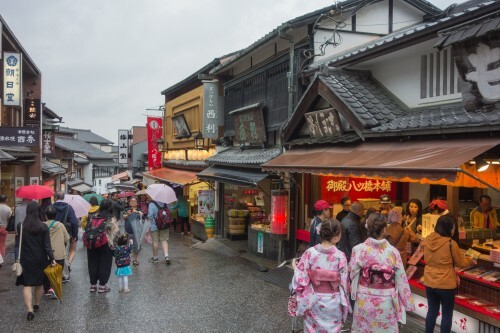 It is up a hill on a walking street that is lined on both sides with shops and restaurants. You can't drive that close, so we parked at a bus lot and then we walked 10-15 minutes up the hill just to get to the base of the temple complex. 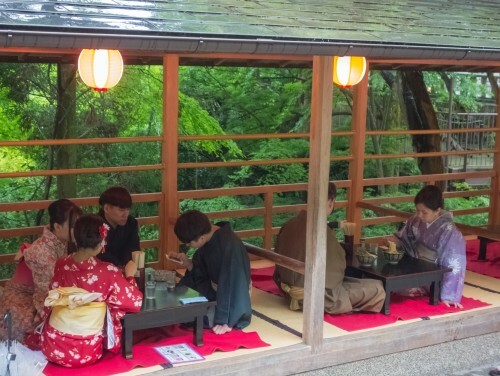 Saiko told us it wasn't that busy, which made us wonder how busy it normally is, as it was crowded as it was. 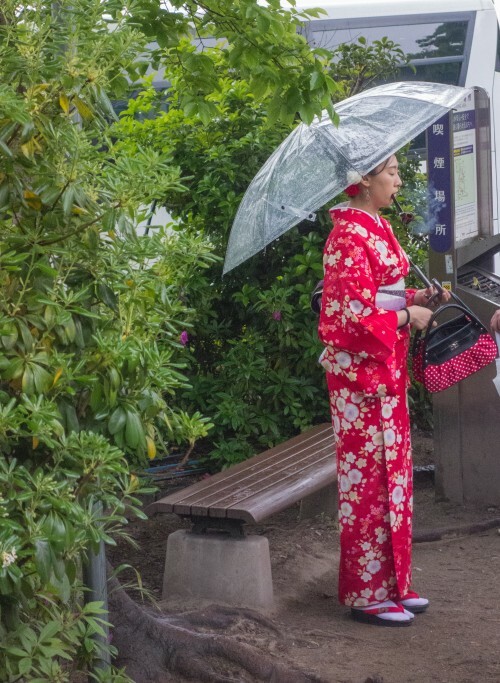 The area was full of women wearing kimonos, and some guys wearing hakamas and haoris. Most of the people dressed up looked to be young adults, maybe young 20s, but who knows. 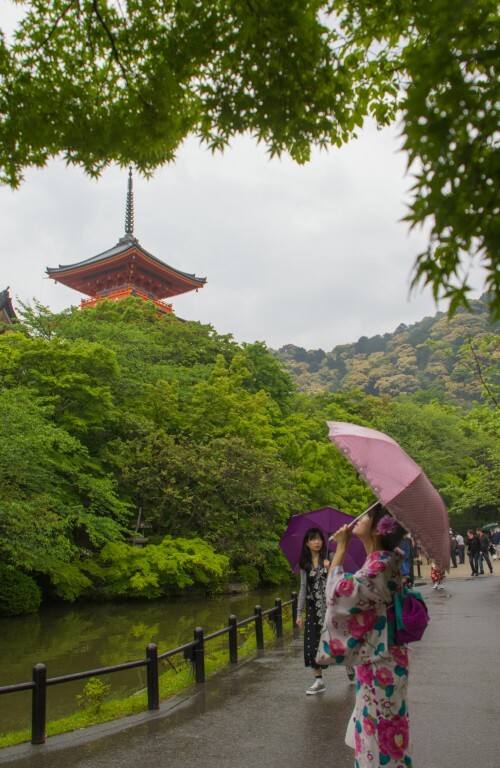 There were also umbrellas everywhere, and about as many selfie sticks. It was so busy that once we got our tickets to get in, Saiko pretty much let us go on our own immediately, as it would have been impossible to lead 40 of us around and have us hear anything. We had an hour or so to walk around, and we split up about halfway through. Crystal did some shopping on the street below, and Justin wandered around up above trying to get photos of the temple and Kyoto below, although the view of Kyoto was really limited because of the rain and clouds. 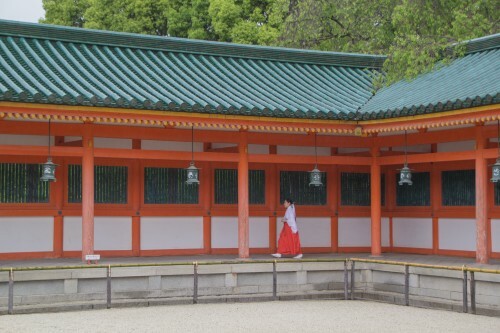 Behind the temple was a shinto shrine, and this particular shrine was for young people trying to find a partner. Supposedly if you walk from one rock to another, with your eyes closed, things will go well for you. That seems hard enough as it is, but with people wandering around everywhere, it would seem like you'd constantly be bouncing into people. 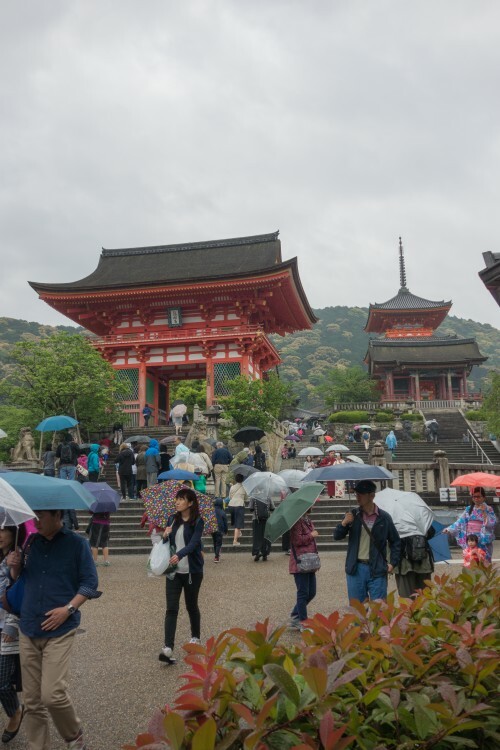 While we were up at Kiyomizu, it started raining a little harder, to the point it really wasn't safe to have the cameras out any more. So Justin would just take the camera out when he had a tree or awning overhead. 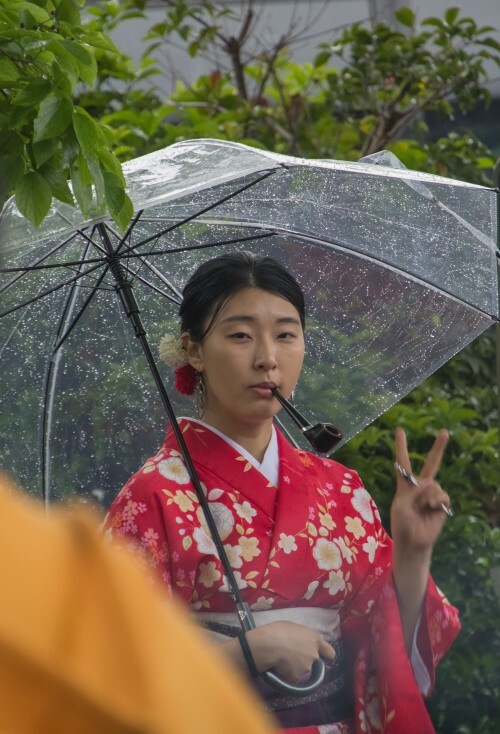 That being said, one subject that warranted taking the camera out, even in the rain, was a young lady in a red kimono that was smoking heavily on a big pipe and was completely zoned out - not something you see every day. The bus dropped us not at our hotel, but at least a nearby one where the walk was a short one, maybe 5 minutes. We grabbed happy hour at the hotel bar, The Library, and caught up on world events. We realized that not only was Ted Cruz out of our lives, so was Carly Fiorina, so we toasted that. We tried to get dinner reservations at a couple different places, but to no avail. One was a place that Dewey's friend had recommended that we'd driven by earlier (Spoon), but it as booked. The other was a Japanese curry place that we'd found (Spice Chamber), but they didn't answer and the concierge was pretty sure they didn't take reservations anyway. So we got reservations at Hafuu, a steakhouse that had come highly recommended. If not for knowing exactly where it was, and having the taxi driver know where it was, we never would have found the restaurant - from the outside it looked just like a house. We all got the set meals, with the guys getting the Original Dinner course and the women getting a very similar course that was almost identical - it had beef tongue instead of the sliced brisket. Everything was phenomenal, as was the service. The only downside was that we were in a quiet room in the back, and one of the other two tables had 4 people from Houston who didn't seem to know what "inside voice" means. After one especially loud part of the conversation, Justin leaned over to Crystal and whispered "can I have the baby back?" They left about 2/3 of the way through our meal, and we enjoyed the last 1/3 in peace. We got a taxi back and arrived around 10pm, then went straight to sleep.